The characters in many of F. Scott Fitzgerald’s stories—rakish, drunken undergraduates and overeducated gadabouts—so resemble their creator that it's tempting to read into all of his work some autobiographical intent. One episode in the writer’s life that didn’t make it into his fiction, Fitzgerald’s meeting with James Joyce in Paris, nevertheless makes a fascinating anecdote all its own, and seems so perfectly in character that it could have inspired an amusing short story for The Saturday Evening Post. 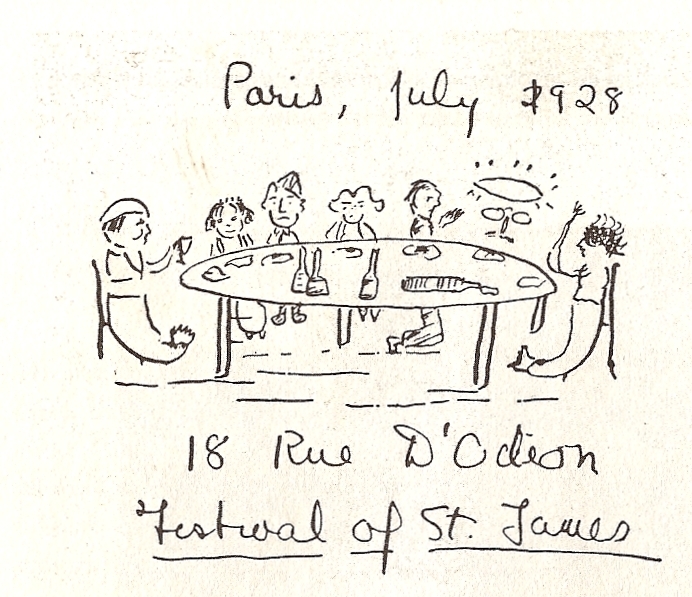 Scott drew a picture in my copy of The Great Gatsby of the guests—with Joyce seated at the table wearing a halo, Scott kneeling beside him, and Adrienne and myself, at the head and foot, depicted as mermaids (or sirens). Most likely very drunk on champagne, Fitzgerald’s antics apparently quite alarmed Joyce. In her literary history, Noel Riley Fitch tells us that the American “offered to show his esteem for the Irish writer… by jumping out of the window. An amazed Joyce is supposed to have prohibited the display and exclaimed, ‘That young man must be mad—I’m afraid he’ll do himself some injury.’” The bizarre incident did not prevent Fitzgerald from obtaining Joyce’s autograph in his copy of Ulysses. Nor did it prevent him, on a later occasion, from threatening to jump from his apartment balcony onto the street, “drunk and depressed by his failing marriage.” This time, he was stopped by French novelist André Chamson, with whom he had struck up a friendship at the Joyce dinner. Beach’s memoir contains many other charming, and somewhat dismaying, stories about the Fitzgeralds, most involving profligate spending and drinking of champagne. We may not have the pleasure of hearing these tales from the Gatsby author himself—save through his essays, letters, and many fictionalizations of his life. But the genial Beach, who outlived Joyce, Fitzgerald, Hemingway, and most every other author of the “Lost Generation,” appeared in several filmed interviews, in French and English, and told stories of 1920s Paris. In one such interview, above, hear her describe the founding of Shakespeare and Company, that Parisian literary hub without which some of the greatest literature of the 20th century may never have reached the reading public. The drawing is in Joyce’s copy of “Gatsby” in the Princeton University Library, for those who’d like to know where the original is. (They also hold the copyright to it). The literary historian Noel Riley Fitch is a woman. Thanks for the correction, John. I’ve amended the post.